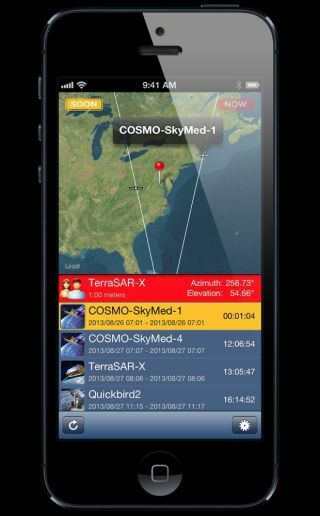 Screenshot of the new iPhone app SpyMeSat, which lets users track overhead imaging satellites. In case you're hungry for personal space situational awareness, or are just plain paranoid, a new iPhone app can tell you when and what imaging spacecraft might have you in sight. Orbit Logic of Greenbelt, Md., has created SpyMeSat, an app that provides notifications when spy satellites and unclassified imaging satellites are zooming above your head and may be taking your picture. A dynamic map shows orbit tracks and the location of remote sensing satellites with upcoming passes over a user's specified location. "I actually got the idea for the app from talking to friends outside the aerospace industry who were always very interested in space and satellites and imaging from space. This app answers those questions in a fun and interactive way," Herz told SPACE.com. The SpyMeSat app makes use of multiple sources, including orbit data from the North American Aerospace Defense Command (NORAD). The NORAD spacecraft data come viaCelesTrak, a website designed to provide current orbital software, educational materials and links to software to support tracking satellites and understanding orbital mechanics. That information is melded with available public information about commercial and international imaging satellites. The iPhone app user can see a satellite’s trajectory around his or her location, as well as get an alert when a camera-snapping or radar-scanning satellite might be in range. Moreover, the app user can learn more details about each imaging opportunity, and also peruse a page describing the satellite that's zooming by overhead. According to Orbit Logic, SpyMeSat users can organize the app in several ways, such as modifying the location of interest. All of the imaging satellites in SpyMeSat are in low-Earth orbit at an altitude of about 500 miles (805 kilometers). Enabled SpyMeSat satellites include such zoom-lens notables as GeoEye, the French space agency’s SPOT-5, India's CartoSat-2A, DigitalGlobe's WorldView satellites and Canada's RADARSAT-2. Of course, a SpyMeSat imaging-pass notification doesn't necessarily mean that a satellite is taking your picture. An identified satellite could have its camera in off mode or pointed elsewhere along its ground track. SpyMeSat does not include all imaging spacecraft. No classified imaging satellites, from any nation, have their orbit information published, so these satellites do not show up in the app. The app does include imaging satellites with resolution capabilities of some 16 feet (5 meters) or better for which orbit information is published by NORAD. For the most part, these are commercial satellites or openly acknowledged government satellites from other countries. An artist's interpretation of Canada's Radarsat-2 Earth observation satellite in orbit. When pondering the potential uses of this app, might it not help hide nefarious actions from orbiting eyes — say by a terrorist group, somebody whipping up a batch of plutonium or perhaps those involved in human rights wrongdoing? Herz said that people have already mentioned possible use of the app by terrorists. "We were careful to only include satellites that are unclassified and whose orbits are published by NORAD. Even the sensor data — resolution, etc. — was taken only from the websites published by the satellite operators. So everything SpyMeSat is using is open and public. Even the computations are basic orbit math taught in colleges everywhere," Herz said. "We can also track app downloads by country through the Apple App Store," he added. "So far, no terrorist countries — unless you consider Brazil, Switzerland, Canada, Germany or Australia, terrorist havens." Responding to a SPACE.com query, John Pike, a leading expert on defense, space and intelligence policy and director of GlobalSecurity.org, said: "Anyone who was trying to hide from such satellites was already doing so." SpyMeSat requires iOS 6.0 or later. The app is compatible with iPhone, iPad and iPod touch and is optimized for iPhone 5.